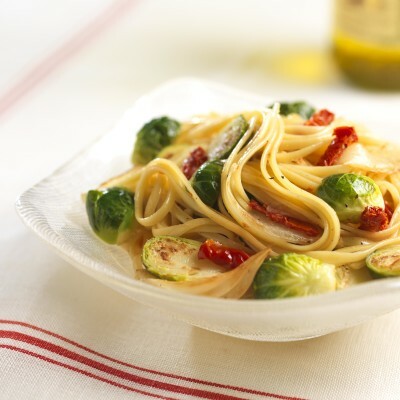 Brussels sprouts make this pasta dish healthful and delicious. Peel onion and cut into six wedges, being careful not to trim too much off the end that holds each wedge together. Place onion wedges in the hot skillet with one cut side down and cook without stirring for two minutes to allow browning. Carefully flip the wedges and add Brussels sprout halves to the pan cut side down. Cook for another two minutes until Brussels sprouts begin to crisp. Stir the contents of the pan, encouraging the onion wedges to separate into slivers. Add sundried tomatoes, chicken broth, vermouth, cream and bring to a simmer. Cover pan and reduce heat to medium low. Cook for ten minutes or until sprouts are tender. Cook the linguini according to package directions for al dente, reserving 1/4 cup cooking water. Add drained pasta and 1/4 cup reserved cooking water to skillet and toss over medium-high heat until most of the liquid is absorbed. Season with salt and pepper and serve with Parmesan cheese.